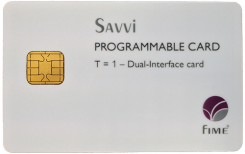 The American Express Softcard library is an optional upgrade for the Savvi Test Platform. The library contains Softcards to conduct Global AEIPS Terminal E2E certifications, Global ExpressPay EMV Terminal E2E certifications and AMEX Quick Chip Terminal certifications. The American Express Softcard library is an American Express Qualified Test Tool. It can be used for American Express certification testing of any type of contact and contactless terminal, POS and ATM. Softcard libraries are kept up-to-date automatically thanks to the online automatic software update feature available in the tool. Savvi is able to save card logs in the American Express format which can then be uploaded on the on-line American Express Test System (ATS). The Savvi Test Platform provides support for three different types of test media, the ready-to-use physical test cards, the programmable cards and the card emulator. Testers preferring using physical test cards can refer to FIME acquirer test card products.